"I found your site via an image search for Botticelli and just wanted to say I really like it! From your site I found links to other art and history blogs I didn't know existed. Finding these things should be easier. I wish there was a Google for art and history blogs!" -Feedback from R.(Student, UK). Since the recent targeting of art history sites by toplists, a Google search for 'art history blog' will send you to the sites of these unscrupulous characters whose main aim is to entice traffic to their site, rather than serve the interests of anyone interested in art and history. To remedy this, it is now time to publicly announce a project I have been steadily working on for a few months. The Art and History site Database(AHDB) has been created to serve a specific purpose. Searching online for quality sites dedicated to art and history has become a time consuming process. The Wiki entry for a particular topic or artist is usually the top result in many instances, followed by a slew of image gallery or painting reproduction sites. With particular regard to blogs on the topics of art and history, there is presently no detailed resource that attempts to catalogue these sites and create a search engine that searches only these sites. Before starting this project I wanted to make sure that no one else had done this. The closest I found was this list of blogs from the Courtauld Institute of Art. Google itself has a blog search engine, which is getting better, but still quite nebulous with its results. Its greatest feature is the ability to create custom RSS feeds from favourite search queries, so it is definitely a recommended bookmark for that alone. There were a few other webpages with lists, but each shared the feature of not only being incomplete, but being somewhat difficult to search. Hence the idea of AHDB having a Google style search page seemed to make the most sense from a user friendliness perspective. This project was commenced in November 2010 and has been tested by a closed group of students and art historians. The basic aim is to create a useful tool to make finding art and history sites easier. There are many resources for art and history online but one that aims to include blogs simply does not exist. An increasing amount of art historians, classicists and authors are now blogging, and there should be a resource to find them that is as easy to use as Google. AHDB consists of two separate ways of searching. Both are presently created using free tools provided by Google and Zoho. The site itself is actually a heavily modified blog page that serves as the search engine, and includes information and updates. Unlike other search engines and digital resources, this means that I was able to deliver a fully functioning resource at an extremely low cost. I think this parallels the spirit of online publishing nicely. So much of what happens in the academic and publishing realm is dependent on an initial outlay of funds. It was nice to be able to use some free tools and my tech savvy and build this from scratch. The AHDB home page is allocated for the custom search engine. This is where you type in a particular topic, artist etc, and it will search the specialised list of included sites for posts related to that topic. The first phase of the project will focus on art and history sites and blogs. Wiki and and some art news sites are excluded from this option because their high page rankings in google corrupt the search engine's ability to find relevant blog posts. There are presently just over 200 sites in this search engine. The sites included in this search engine are at the discretion of the the administrator and not publicly available. When building AHDB I quickly recognised that a more detailed system for publicly listing sites and allowing others to submit their own was necessary. To achieve this I used an online database program made by Zoho. This platform is used prolifically in the business and education sector, some of its clients including Sony, BBC, Harvard University and the United Nations. I am quite familiar with it from other data analysis work I have done, and was delighted to be able to use a basic version of it for free to kick off the AHDB. The site list will display the details of all the sites entered into the database. It also allows for detailed searching via category, type of site or key topic. For more information on what the fields mean in the site list - please see the AHDB site list and give the advanced search and sorting features a try. Anyone is allowed to submit a site they would like added to the list. As a quality control measure, it must be noted that registration is not an automatic process. Each submitted site will be reviewed. Sites run by artists to promote their own work are allowed as long as there is an accompanying blog that discusses art technique. A great example of this is Mia's Blog, where contemporary artist Mia Araujo discusses her current projects and exhibitions. Artist, reproduction, or poster sites that are entirely retail in nature will not be approved. This project has been designed to promote art and history sites online. It is an ongoing initiative that aims to be an easy to use interface to find other art and history sites, particularly blogs. I would like to thank the art and history blogging community for their ongoing inspirational work, and a special thank you to Alexandra Korey who provided the initial spark. Many sites that are frequented by me are of course already in the list, but if you would like to add details to your entry, feel free to let me know or simply fill in the registration form, and I will update the original entry from it. To enter your details - simply fill the form below and press submit, or visit this standalone registration page. Great job, H! I'm very excited about this. What a great job. It even searches blog comments. Despite your expressed objections, I think you should monetize this site to compensate you for all your work. Very exciting announcement! This will be a fantastic resource for lots of people. Great work, H! Cheers for the comments. Remember to let me know if you have any suggestions or ideas, or have noticed any glitches. @Frank - I just want to see how well it is utilised. As the list expands(beyond 1000 sites for the online database) the free version of the tools will no longer apply so may have to look into options then, with relevant funding bodies. What a commendable idea. I look forward to getting to know my way around what I am sure will be a very useful resource. I, too, was recently included on one of those marketing-ploy '50 best art history blogs' lists and need something a bit more reliable for research. A wonderful site you have here; I came here via Margaret of The Earthly Paradise. Cheers for the lovely feedback Lorenzo! Alchemist's Pillow looks like a lovely blog, I've since added it to the AHDB. It was because of Lorenzo I heard of your initiative. I'm looking forward to taking a closer look around. Hello Maureen! 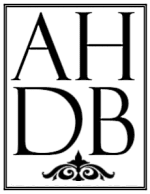 Thank you for stopping by and thank you to Lorenzo for posting about the AHDB project at Alchemist's Pillow. I was delighted to discover your 'Writing Without Paper' blog as well - and will add it to the listings shortly. What a treasure! Finding wonderful new sites to explore is exactly what the project is about.